Within the space of a few lines we are propelled from a world of ‘pens’ and ‘tea-pots’ towards ‘smouldering cars’ and ‘shattered paving slabs’. The tone is understated but the details accumulate effectively. Nudged along by the short ‘e’ sound in ‘text’, ‘pens’, ‘heads’, the rhythm is quietly insistent. From here on, the tension mounts steadily, as ‘through gaps in niqabs / passions blaze’, until the poem is brought to its eloquent conclusion: ‘And history is made.’ If this is a ‘political’ poem, its strength lies in its journalistic focus and its lack of stridency. a knotted mass of metal, batteries and wires. The desert holds its breath. don’t take the easy path – do what you know is right. Guilt is something I could do without. of sleep was nothing to the wildness in men’s eyes. ‘Thank God’, she said, ‘I never fired a gun’. In recent years, with the proliferation of workshops and creative writing courses, it has become increasingly difficult to see the wood for the trees. 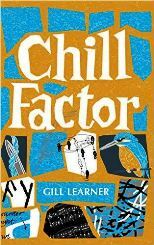 However, there can be little doubt that Gill Learner is a poet of formidable gifts and that Chill Factor is a collection to be wholeheartedly recommended for its breadth of vision, its depth of feeling, and its unerring way with language.